In the past, we’ve described Motionloft as an “incredible example of the huge potential data visualization has for commercial real estate.” For this exclusive Q&A, we were lucky enough to be joined by Mark Cuban, an investor in Motionloft, who provided us not only with an update on what’s going on with the company, but his views on the real estate technology sector overall. CRE App Review: Can you give us a quick overview of Motionloft? Mark: We are Google Analytics for the real world. They count webtraffic. Motionloft provides a turnkey solution that counts and reports on indoor or outdoor pedestrians and vehicles in real time. Our goal is to give you the data you need, that you were unable to reliably obtain in the past to make critical decisions. We provide you data that allows you to make mission critical decisions based on time, counts, flows, and more. In the past, companies had to guess or rely on years old data to make decisions. No longer. Motionloft allows you to have confidence in your decisions. CRE App Review: What are some of the major recent developments at Motionloft? What's next for the site? Mark: Motionloft continues to push the envelope by continuing to shrink our sensors and press the limits of computer vision software and algorithms. Pushing down the size and extending our algorithms allows us to place our sensors in more diverse locations, capture more types of data and even add new features to our sensors. Not only can we count, but we can include incremental data captured by our sensors that includes moisture, noise, gasses, temperature, and much more. CRE App Review: Why has it taken the commercial real estate industry so long to embrace the power of analytics, as opposed to so many other industries, which are ALL about analytics and data? Mark: The industry certainly realizes the power of data. The problem has been that the tools have not been there. Historically, data has been captured manually, particularly pedestrian traffic, or using outdated methods with both pedestrian and traffic data. Plus, there have been quite a few missteps prior to Motionloft. Retrieving and analyzing security footage was slow and expensive. Trying to leverage Wi-Fi created privacy concerns and was not accurate. Motionloft is the first purely sensor-based solution that can be offered inexpensively and is fast enough to allow the industry to make profitable decisions. So, I don’t think it was a lack of intent, I think it was the fact that the right product wasn’t available until Motionloft came along. 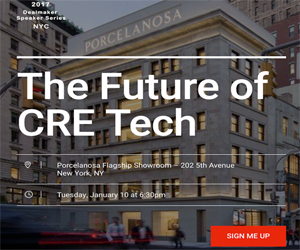 CRE App Review: Commercial Real Estate is one of the last frontiers to embrace technology. Why do you think it has taken so long? Mark: Real estate is an industry with long time frames for the development and holding of properties. Decisions last a long time in real estate. Taking care in those decisions makes sense. Experience with our real estate customers showed us that once the due diligence is done, they are all on board with using our data in their strategic and operating decisions. CRE App Review: Are you considering any other investments in the sector? If so, what areas do you think offer the most potential? Mark: I’m always looking. I see Motionloft and our sensor and computer vision driven approach as a platform. I just invested in a company, Netria, that does image recognition that can help computer vision, particularly for internal retail, to be smarter. I expect to invest in many more sensor and vision-based deals. For more information about MotionLoft, check out this FunnelCast Q&A with the CEO of MotionLoft, Joyce Reitman. Older PostA CRE App Review EXCLUSIVE: Hightower Scores Another Huge Funding Round!